Great shopping and interesting towns, just a short hop across the Channel. Pas-de-Calais has much more to offer than shopping, although that is one of the main reasons for many visitors. There is the dramatic grandeur of the coastline, the gentle beauty of the rolling inner landscape and towns with some of the finest architecture in Northern France. What’s more, it’s easy to forget that all this is only a few miles across the English Channel! For those that want to escape the clamour of the town, there is a long, golden coastline to explore, dotted with wonderful resorts and dramatic cliff structures. 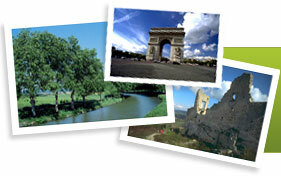 The most famous of these resorts is probably Le Touquet, which has come to be known as the Paris of the North. During the 1930s this glamorous retreat became the playground for the ‘smart set’ of the English literary scene, who regularly used to decamp here for leisurely weekends. There is also the enchanting town of Montreuil with its ancient ramparts and Boulogne with its still-standing medieval city walls.